It's been a fantastic year in jazz. Many mainstream critics have writen off jazz which I think is incredibly dumb. Of course if you look at it from the sales/profit standpoint, critics would have a case. But since most of us are here to listen and enjoy the music, I would say its alive, well and still creative as ever. I've been listening to allot (probably more than usual) this year and each day over the next week we'll discuss the albums that have been on repeat on the stereo this year (in no particular order). The Vandermark 5 has been taking the jazz scene on both sides of the Atlantic by the throat and restructured it over the last decade. Led by the uncompromising Ken Vandermark, the group has changed lineups on numerous occasions but continues to be a challenging force that takes two leaps forward with each album. In the vein of Ornette Coleman, Charles Mingus and Eric Dolphy, The Vandermark 5 refuse to settle on laurels of their previous efforts. The newest lineup just released its first live album, Annular Gift (Not Two Records) recorded live at The Alchemia in Poland. While carrying the torch for Free Jazz, The Vandermark 5 have made one of their most balanced albums since Music For Airports (2002) and Elements In Style (2004). While the album is always a group effort, the standout performances from Dave Rempis (sax) and Fred Longberg-Holm (cello) throughout Annular Gift make this one of the best Free Jazz albums of the year for me. This is no more evident than on the openning track "Spiel" and "Early Colour" where both shine along with drummer Tim Daisy. The album shifts from stylistic modality to beautifully cacophony with great ease. When you listen to this, even as someone who may not be a fan of the avant garde, you will realize the melody and muscle this band possess and find your own center of appreciation. There are so few jazz bands on the scene today, particularly ones that are consistently great each time out that you have to stand up and cheer for a band like The Vandermark 5 who write aggressively and convene every year to amaze themselves and the fans regularly. 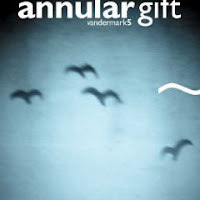 Annular Gift may not be the best starting point for the uninitiated but it is worth your time to listen, as you definitely hear one the best groups around. It is clear - The Vandermark 5 appear to have no intentions of disbanding anytime soon.